For many investors, it feels like they're living in a moment of madness. 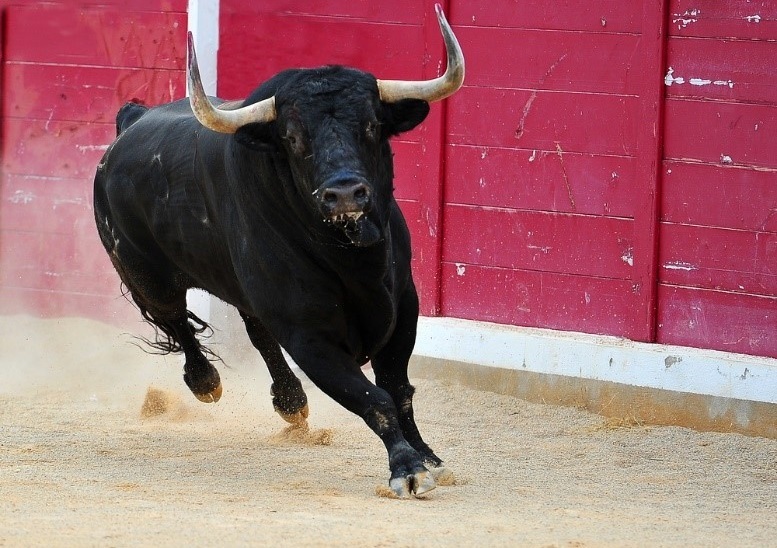 During an eight-day span over the past two weeks, the Dow Jones Industrial Average (Dow) had seven days of at least a 1% move up or down. And that doesn't even include all the intraday gyrations (like when the Dow opens down 500 points and ends the session up more than 200, or vice versa). It's been a roller coaster - a whipsawing market that's threatened to buck investors from their saddles. But for short-term traders and options traders, these are the times they live for. Markets that move in one direction are boring. And prices can be unattractive. For everyone else... not so much (as is evidenced by all the texts and emails I'm getting). 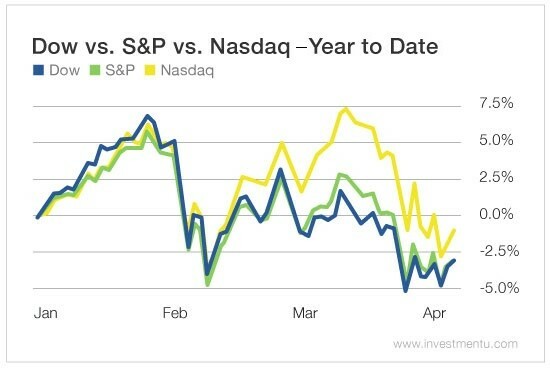 For the next few weeks, investors will "definitely maybe" enjoy a different tune than what they heard during the last days of January, February and March. April gains have practically become a "gimme." Now, to kick off April trading this year, the Dow did suffer its worst loss to begin the month since 1929. And with the way things have been going recently, there's no telling what will spark the next sell-off. But there's an old trader adage I like... one that my colleague ETF Strategist Nicholas Vardy recently referenced too: "The trend is your friend." 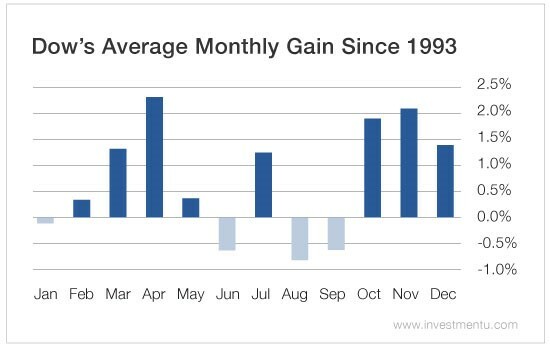 Since 1993, April has been the best-performing month for Dow components. And 2005 was the last year the Dow ended the month of April down. That's 12 consecutive years of gains spanning three U.S. presidents. That's a better streak than American Idol's consecutive years as No. 1 in TV viewing rankings... and longer than the Boston Celtics' championship run from 1959 to 1966. Over the past 25 years, the Dow has closed out April with a monthly loss only six times. No other month on the calendar is nearly as strong... or as consistent. So why has April's performance been so good, regardless of Bush (not the other popular English rock band from the 90s... but Bush 41), Clinton, W., Obama or Trump? It really is the changing of the season. Fourth quarter earnings reporting takes place in February and March. Depending on the sector, these reports can be rough. The first quarter ends on the eve of April Fools' Day. Investors then position themselves based on all the data that's available... and optimism leads the charge into first quarter earnings, which begin in earnest later in the month (which is also why May tends to be such a downer). As a trader - a trend trader specifically - consistency is how the most money is made. April has been the best month for the Dow over the past 25 years... period. And it gives a momentary respite before the dreaded "summer lull" (easily visible in the chart above). April usually means cherry blossoms, religious holidays, rain... and opening day. But have you been to a ballgame lately (and sat anywhere besides the nosebleed section)? Tickets aren't cheap... and neither are the beers! The days are longer. The weather is warmer. And outside starts looking like a more attractive place to be. It also means the start of the Major League Baseball season, as well as the NBA and NHL playoffs. And our newest Prime System recommendation targets one of the upcoming trends I've followed and played for years - beer drinking season. This begins in earnest with Memorial Day weekend. And it will stretch all the way to the Super Bowl. But some beer makers have Prime Periods that begin now. Craft Brew Alliance (Nasdaq: BREW) is one of them. It's an independent craft brewing company (as the name might suggest) that brews, brands and distributes American craft beers. Kona Brewing Company is its top brand. But its beer portfolio also includes local favorites like Appalachian Mountain Brewery, Cisco Brewers, Omission Brewing Company, Redhook, Square Mile Cider, Widmer Brothers and Wynwood Brewing. Its shares have historically had a difficult time in December and January and then struggle for traction in February and March. The fourth quarter is one of the softest times of year for Craft Brew sales. And that leads into the slowest time of year for the company, the first quarter. But revenue spikes higher in the second quarter - its most robust quarter of the year. And it continues to have strength into the third. The upcoming first quarter report is prone to big swings. And the second quarter earnings release is dominated by positive momentum higher. That's the trend our Prime Period on Craft Brew shares seeks to capture. So that stretches from today until mid-October. Over the past five years, this Prime Period on Craft Brew shares has returned an average of 44.96% with an 80% success rate. Last year, the gain was 40.5% for this Prime System play. Over the past 10 years, this Prime Period on Craft Brew shares has returned an average of 52.7% with a 70% success rate. At the moment, shares of Craft Brew are 5.7% below their 52-week high of $20.10, which was set back in January and November. For full-year 2017, Craft Brew reported revenue increased 2% to $207.5 million. But the company saw shipments decrease 3.5%. Though 3% of that was a 10-day reduction in wholesale inventory. For the first quarter, revenue is expected to be roughly flat at $44.1 million. But it will see nearly 4% year-over-year growth in the second quarter as revenue is expected to jump to $62.9 million. Plus, earnings per share in both upcoming quarters are expected to improve significantly.